I updated to the new version today and immediately noticed a bug with the registry cleaner. When it scans for errors it only scans the top item in the list, see attached screen shot. When it scans via the system check-up it does seem to scan the entire registry. Note in the pic how only the top item has a green checkmark, none of the others do. Please try to uninstall current version, then install it again. I did an uninstall then re-installed the latest version and the problem persists. No problems here: I'm using W10 std x64 (updated) and Wise Care 365 5.1.5.505 (portable). Instead I found this (registry cleaner): the tooltip is shown only for the first part (version) in firewall settings. In advanced cleaner, it says "Congratulations! Your computer is clean. ", but instead there are files to be removed. The type column shows Italian strings instead of English ones (I changed from Italian to English, previously). The tooltips of the type column show the first part in Italian, the second one in English "(This item can be deleted safely).". The tooltip suggestion for "User define" is "unknown", but I can't find its string, therefore I can't translate it. If I change the language after the scan, all strings remain in previous language. In system monitor, hardware overview, the mainboard shows "AsRockFM2A88M Pro3+( )": AsRock should be separated from FM2A88M, the first parenthesis should be separated from Pro3+, inside the parenthesis there should be something (or it shouldn't show the parenthesis). It would be nice to have the possibility to copy the strings directly in the program. In system monitor, hardware overview, processor, temperature shows about 10°C: could it be you forgot to add 32, hence 42°C (for the conversion from °F to °C)? The same is valid for the graphic card (embedded in my processor). The hard drive temperature says 31°C. Could it be 63°C ? In system monitor, hardware overview, memory: my MB (AsRock FM2A88M Pro3+) has got four memory slots. Three are occupied, one is free. Three are shown, one is not. I think the empty slot should be shown. Near each memory slot, it says "DIMM 0" or "DIMM 1": the information about channels A and B is unavailable. I will send your report to developer team. 1, The theme issues is fixed. 2, The memory tab only shows plugged in memory. In Motherboard tab, it will show all memory slots. Not here: WRC8 found 73 problems in 57sec (the second time, 41sec), WCare365 found 3 problems in 1m17sec (the second time, 1m10sec). WRC9 found 178 problems in 1m6sec (105 MRU lists more than WRC8). All portable versions, with same settings, exclusions and PC. Please try wise care 365 v5.18, we improved registry cleaner. Please check attached image, WRC 9.56 and W365 5.18 are almost same except File Types. I see. 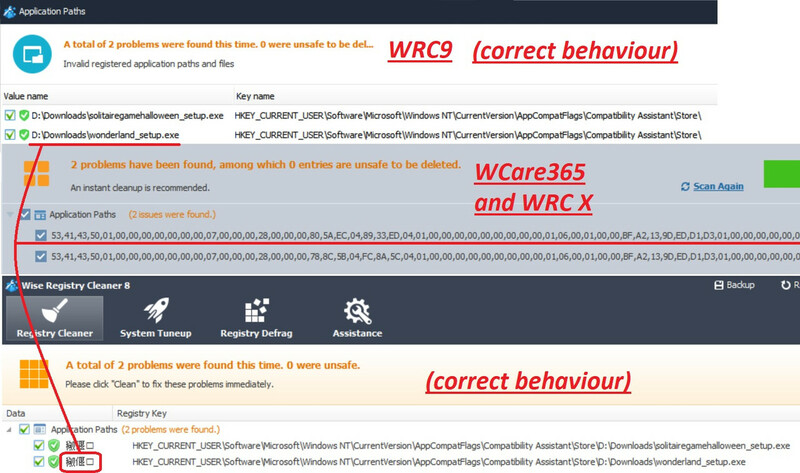 In your system, WRC X and Wise Care 365 v5 skipped some registry items. We cannot reproduce this issue. Can I connect to your system to check it? When I exclude software paths, they find the same items. This problem started in the transition from WRC9 to WRCX. A few people has same issue with you, but the issue item is not Software Path. We know there is bug in Wise Registry Cleaner X, but We have been unable to reproduce this problem. Another one: WRCX and WCare365 show binary data, whilst WRC8 and 9 show the value name. Sections: application paths and user mru lists. It is really hard to read. I will send it to developer team. New test with wrcx latest version 10.1.2.669. Always same settings (I enabled all sections), all the three programs are the portable versions and the exclusion.dat is the same for all versions. wrcx still shows binary data in Application paths and user mru lists sections. wrc8 is still the fastest, wrc9 is still the one that finds more items. WRC 8 is the fastest, because it doesn't scan some registry path. WRC 9 finds the most problems, because it may misjudge certain items as invalid registry value. WRC x is better than previous version although it is not the fastest. Ok, today I made another test and seems you guys found the problem and fixed it, correct? Now WRCX and WRC9 find almost the same items (like in yesterday test). And indeed that file doesn't exist anymore. Anyway, "application paths" and "user mru lists" still show the unreadable "value name" in binary format. 1, In my computer, WRC 9 and WRC 10 have same scan results of Software paths. Could you please export it and send to me? 2, If WRC display registry key name instead of key value, the first column are almost 0/1/2/3..., not only software paths but also all items. I already send your suggestion to developer team, but I guess this work is too hard, so that they have not done it now. 2) This problem (binary format) appears only in those two sections: "application paths" and "user mru lists". This didn't happen with WRC9 and previous versions. 1, Actually, I want you export this registry HKEY_CURRENT_USER\Software\7-Zip\FM, then I will import it into my system to check. It is disappeared now, so we can forget it. 2, I will report it again.